As long as Newark Eagle-Examiner reporter Carter Ross turns in his stories on deadline, no one bats an eye if he doesn't wander into the newsroom until 10 or 11 in the morning. So it's an unpleasant surprise when he's awakened at 8:38 a.m. by a phone call from his boss, telling him a local policeman was killed and to get the story. Shaking himself awake, Carter heads off to interview the cop's widow. And then he gets another call: the story's off, the cop committed suicide. But Carter can't understand why a man with a job he loved, a beautiful wife, and plans to take his adorable children to Disney World would suddenly kill himself. And when Carter's attempts to learn more are repeatedly blocked, it's clear someone knows more than he's saying about the cop's death. The question is, who? And what does he have to hide? Carter, with his usual single-minded devotion to a good story—and to the memory of a Newark policeman—will do whatever it takes to uncover the truth. 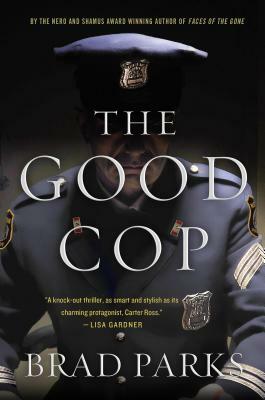 In The Good Cop, Brad Parks is back with all the humor, charm, and human insight his readers have come to expect, and more. BRAD PARKS is the only author to have won the Shamus, Nero and Lefty Awards, three of crime fiction’s most prestigious prizes. A former reporter for The Washington Post and The (Newark, N.J.) Star-Ledger, The Player is his fifth novel. He lives in Virginia with his wife and two small children.